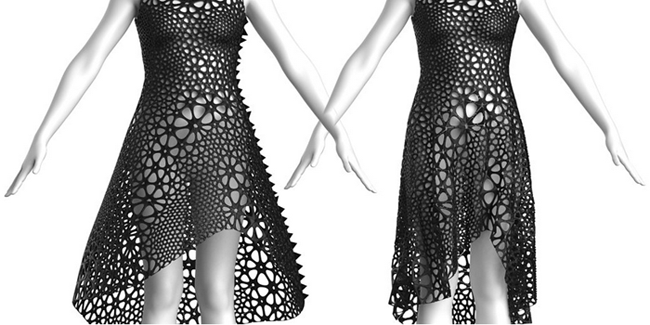 Would you wear a 3D printed dress? On the floor of 2015 Consumer Electronic Expo at Las Vegas, Nervous System and Autodesk debut the second 4D Kinematic Dress. for the un-initiated, Nervous System is a generative design company that works in a variety of disciplines that dabble between science and art and driven by technology. Influenced and inspired by nature, their works is to create new project through digital design and production. One of the design goal is to make a really good artistic detailed product and its usable as a product. that is, with the Kinematic Dressess, its easy on the eyes and you can wear it too. For the Dress shown in CES 2015, Nervous System has teamed up with Shapeways again to produce a more functional example by reducing the size of the hinge joints and thus adding a larger amount of panels. Sponsored by Autodesk and 3D printed by Shapeways, the Kinematics dress features 3,212 panels connected by 4,709 hinges. Kinematics is a system for 4D printing that creates complex, foldable forms composed of articulated modules. The system provides a way to turn any three-dimensional shape into a flexible structure using 3D printing. Kinematics combines computational geometry techniques with rigid body physics and customization. Practically, Kinematics allows us to take large objects and compress them down for 3D printing through simulation. It also enables the production of intricately-patterned wearables that conform flexibly to the body. Kinematics produces designs composed of tens to thousands of unique components that interlock to construct dynamic mechanical structures. Each component is rigid, but in aggregate they behave as a continuous fabric. Though made of many distinct pieces, these designs require no assembly. Instead, the hinge mechanisms are 3D printed in place and work straight out of the machine. As the 3D printing revolution goes on this year, the boundaries of what they can do is being pushed and more people will join the fray and create more ambitious project and we see that we are nearing the age where manufacturing process ways will be affected too and the age of ready-to-use product straight from a 3D printer is coming to a light.